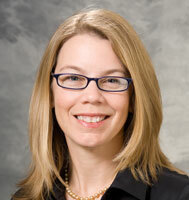 Dr. O’Rourke earned her medical degree at the University of Wisconsin School of Medicine and Public Health (formerly UW Medical School), Madison, WI and completed her residency in general surgery at University of Wisconsin Hospital and Clinics. She then completed a fellowship in trauma and emergency surgery, and surgical critical care at the University of Tennessee in Memphis. Dr. O’Rourke is certified by the American Board of Surgery. She specializes in trauma surgery, emergency general surgery and surgical critical care.